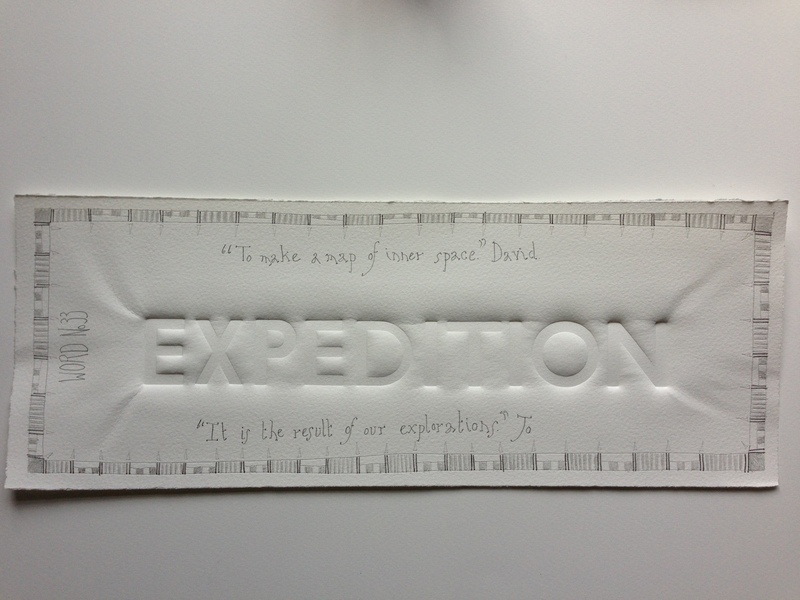 David: Life at the moment seems to involve a lot of expeditions – exploratory journeys with a specific purpose. Somehow the potential fun of the word has leaked aware. Things have gone from being a trip or adventure to the harder work and serious intent of an expedition. To try and combat this, I have been remembering that one of the things I love is exploring. The blank sheet of paper is one of the most exciting, beautiful things. It is an invite from the universe to put words on, to draw lines upon. To make a map of inner space, outer place or a wonderful combination of both. I am trying to remember that every expedition is a chance to explore. Ever expedition is at least giving me more material to apply to the all the future’s blank sheets of paper. Jo: I found art as a mature student, I’d gone back to college to study fashion & textiles. I was on a Foundation Course, full of devil may care teenagers. I can vividly remember, going to my first drawing class & being confronted with a large, white, empty sheet of paper. I recall sitting there, being surrounded by the noise, chatter, laughter of the students, whilst I was literally on the verge of passing out. My heart was racing, my hands were shaking, my whole body was bathed in sweat. I was terrified. Forward some 20 years. For this project, each day I take out a sheet of beautiful 250g Somerset satin white paper, some of the most beautiful paper that can be made. I tear it to the size needed. I take it to my press room & wet it. Whilst it is hanging up, I prepare the type. Setting out the letters, marking the mid points. I lay the paper on top, roll it under the platen, and press. Pulling the bed out, carefully lifting the towels off, I gingerly lift the paper off – there is always that ta da moment. It’s back to my studio, where the paper dries off flat. Meanwhile I read what David has written about the word, and I respond immediately. I pick from his & my text a few words. Then, the joy of what pencil to use from 5H to 9B, & what marks to make, always thinking of it being a map. Each day I wish I had more time to spent working on that piece of paper, but this project has to be kept tight. It’s photographed, and uploaded onto the blog. Finally, that little piece of paper, 14cms x 37cms, is Tweeted to followers around the world. It is the result of our explorations. This entry was posted in 50/50 and tagged depression, expedition, Letterpress, paper, type, words. Bookmark the permalink.